So, I was supposed to write a review of A Brief History of Neoliberalism by David Harvey. I quickly realized that much of Harvey’s argument is taken straight from Capital Resurgent: Roots of the Neoliberal Revolution by Duménil and Lévy. That was not available on the Kindle or my local libraries so I ordered it on Amazon. Waiting for it, I managed to get hold of their recent (2011) book Crisis of Neoliberalism and read it on Saturday. I found Capital resurgent in my mailbox this morning (Monday) and have been going through it. I am yet to finish but I already know I was right to be impatient to read it and also why every single book worth it’s salt on this period of economic history (1970s-present) references this book. I will be posting a proper review later this week but I couldn’t wait to share this insight right away. This book defines what I mean by compulsory reading. 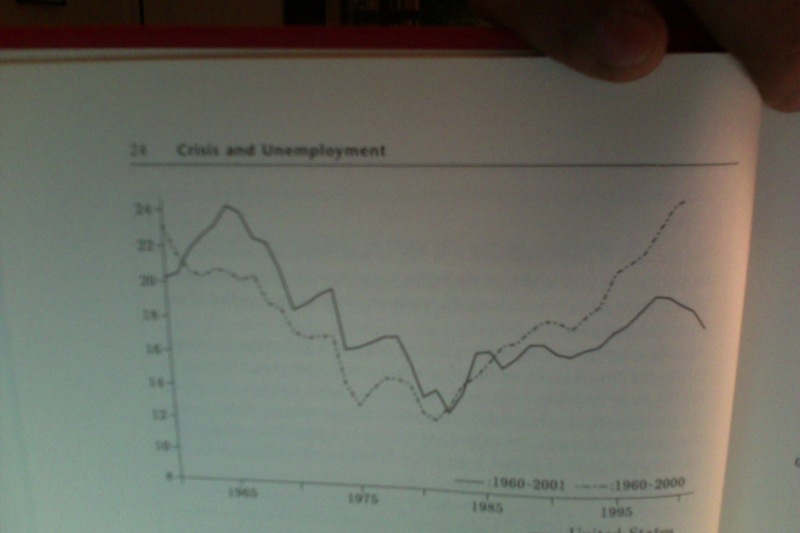 But there was another non-cyclical aspect to the crises. This was the structural crises. This began in the late 1960s and continued till the early 1980s. 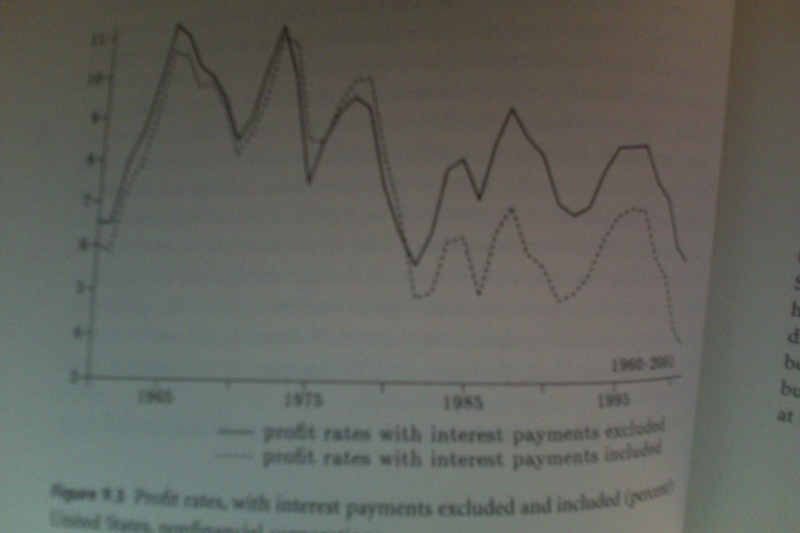 The rate of profit began a steady decline from it’s high of 24% in 1966 to as low as 12% in 1982. Here is a chart from the book (don’t you hate dead tree format already?). The thick line is the US and the dotted line is Germany, France and Britain. Looking at the rate of capital accumulation (growth in capital stock) one finds a similar picture. So there was a structural (non-cyclical) cause of rising unemployment. Namely, the decline in the rate of profit caused a decline in the rate of capital accumulation (which is mostly retained earnings), which led to growing unemployment. Nonfinancial corporations cut down their now very expensive debt and started paying more and more of their profits as dividends to their investors. The dividends paid out rose from a low of 30% in 1979 to 60% in 1986. Thus, the rate of capital accumulation of nonfinancial firms, i.e. their retained earning which account for a majority of private investment in the economy fell sharply and stayed low. Corporate America entered a period of expensive financing where they had to make very high interest payments and dividends to compensate the holders of capital. Therefore, even though the (gross) profit rate trended up strongly after the low of 1982, capital accumulation failed to follow suit. Essentially, the holders of financial assets confiscated all the excess profits of the nonfinancial corporations as interests and dividends. This conversation, is not over.